We sat down with Dr Emilie Szasz, dentist at South Kensington’s Imperial College Dental Surgery, to find out her top tips for keeping our children’s teeth healthy. We all know that children need to go to the dentist, but how often? Children should visit the dentist every 6-12 months unless their dentist finds that they consume a lot of sugar or have fillings or decay in which case they should go every 3 months. Never leave it more than 12 months as children develop decay faster than adults. Children can be reluctant to brush their teeth twice a day, how can we change this? The trick is to get them into the habit from very early on so it’s part of their routine. Children should brush without parental help until they’re 7. Make it fun; sing a song, use an app – there are plenty on the market – or time yourself for the recommended 2 minutes. And remember; don’t get your children to rinse their mouths after brushing as they’ll lose some of the protection that helps to strengthen their teeth. So what food and drink should children avoid? It won’t make you popular but sweets, processed foods and fizzy drinks should be avoided. Raisins are packed full of sugar and get stuck in teeth so should only be eaten at meal times. Fruit, veg and nuts are the snacks we should be handing our children. 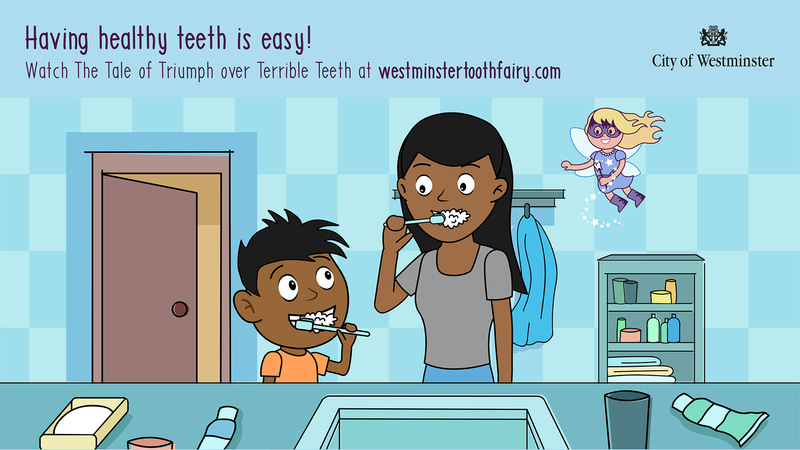 Watch the ‘Tale of Triumph over Terrible Teeth’ with your child to find out more and put your knowledge to the test at the Westminster tooth fairy webpage. This entry was posted in Children / Teens and tagged dentist, Dr Emilie Szasz, Imperial College Dental Surger, Tale of Triumph over Terrible Teeth, teeth, tooth fairy, Westminster. Bookmark the permalink.